California 140, a major east-west state route that spans the Central Valley, travels between Interstate 5 Exit 418 and the central entrance to Yosemite National Park. 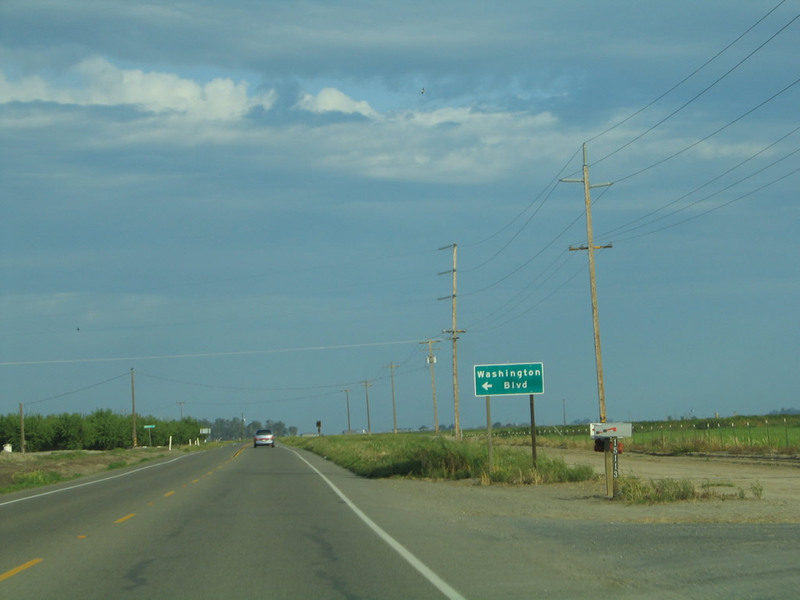 Beginning at the freeway, California 140 passes through Gustine, serves the county seat of Merced, connects with California 49 in Mariposas, and becomes El Portal Road upon entering the national park. The last section of California 140 passes through the scenic Merced River canyon on its way to the park. Photo taken 03/15/15. California 140 is an east-west state route beginning at Interstate 5 west of Gustine and traveling east through Merced and Mariposa to Yosemite National Park. The segment of highway between Mariposa and Yosemite is especially scenic since the state highway closely parallels the Merced River. Recent rockslides and related activity has resulted in temporary closures along this section of California 140, but a permanent solution involving a bridge or tunnel is being developed currently. California 140 east at the interchange (Exit 418) with Interstate 5 west of Gustine. 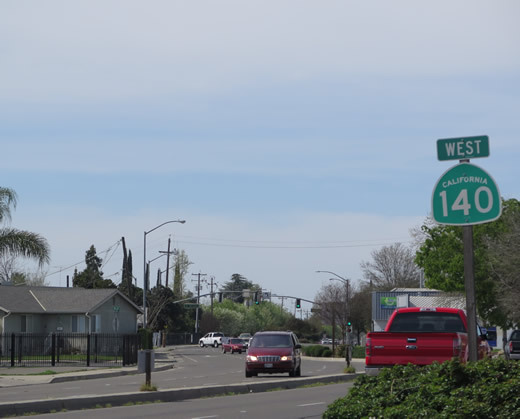 From here, California 140 follows a two-lane bridge over Interstate 5, passes by a few gas stations, then proceeds toward Gustine. 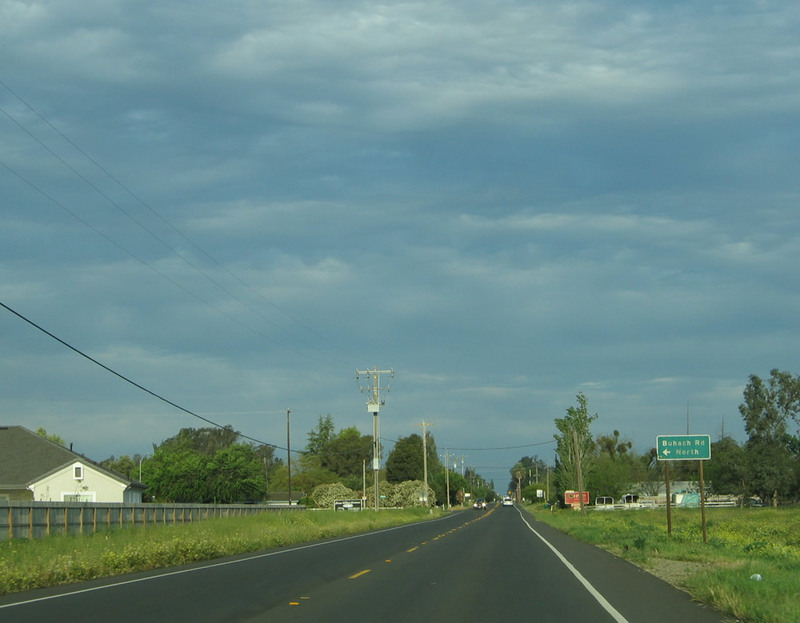 Almost immediately, California 140 leaves Stanislaus County and enters Merced County. Photo taken 04/03/05. The Route 140/5 separation structure carries California 140 over Interstate 5/Westside Freeway. Photo taken 04/03/05. 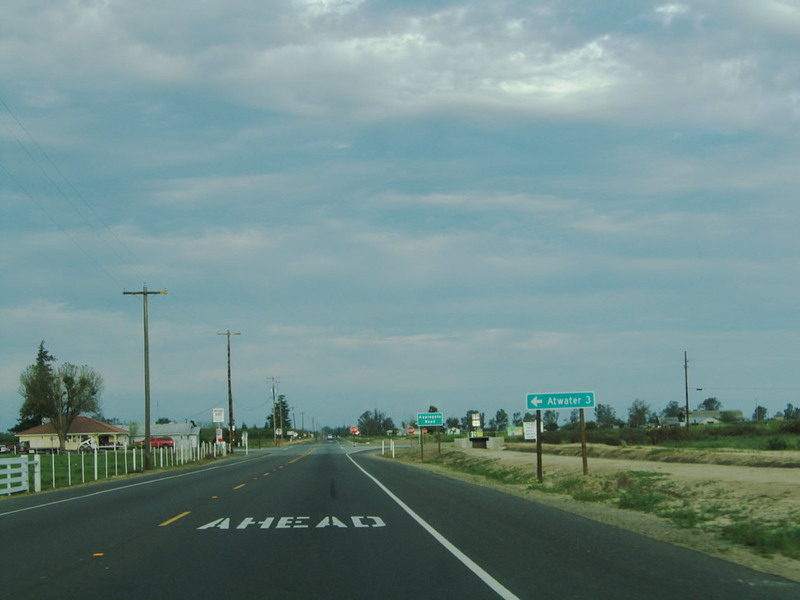 A couple of gas stations straddle California 140 as the highway begins its journey east to Gustine. 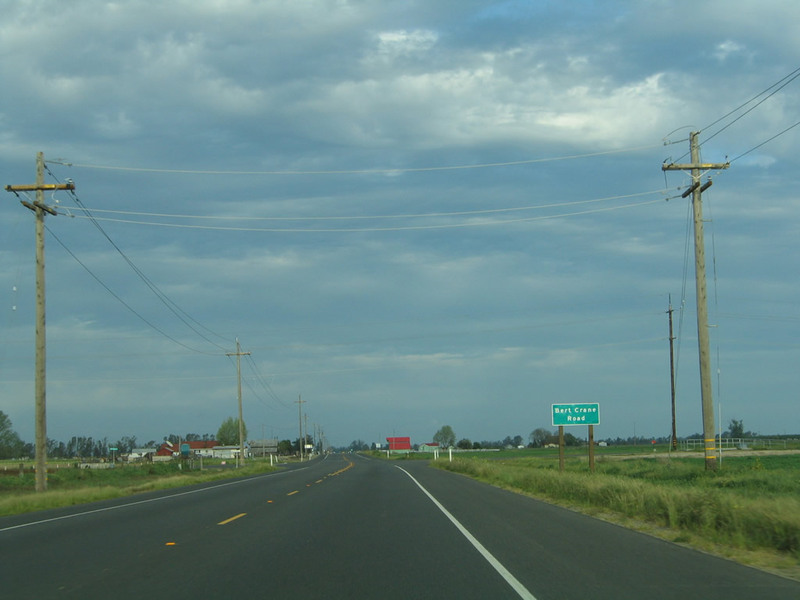 The next left connects to Interstate 5 north to San Francisco, Stockton, and Sacramento. Photo taken 04/03/05. Old style bridge rail lines the Delta Mendota Canal crossing. In addition to the massive state water project (California Aqueduct), other irrigation districts extend across the Central Valley to bring needed water to fertile lands. 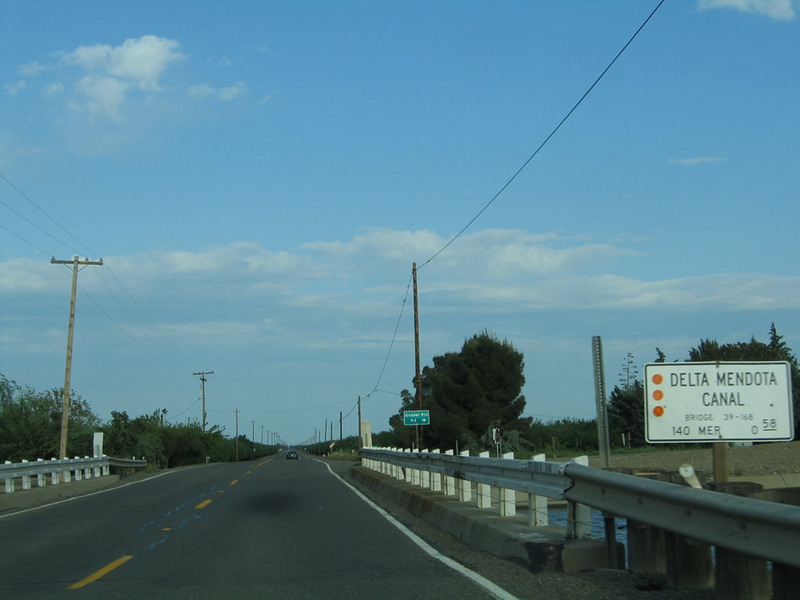 The Delta Mendota Canal (built in 1951) runs 117 miles from the California Delta south to near Mendota; it was constructed by the U.S. Bureau of Reclamation and is operated by the Delta-Mendota Water Authority in Fresno County. 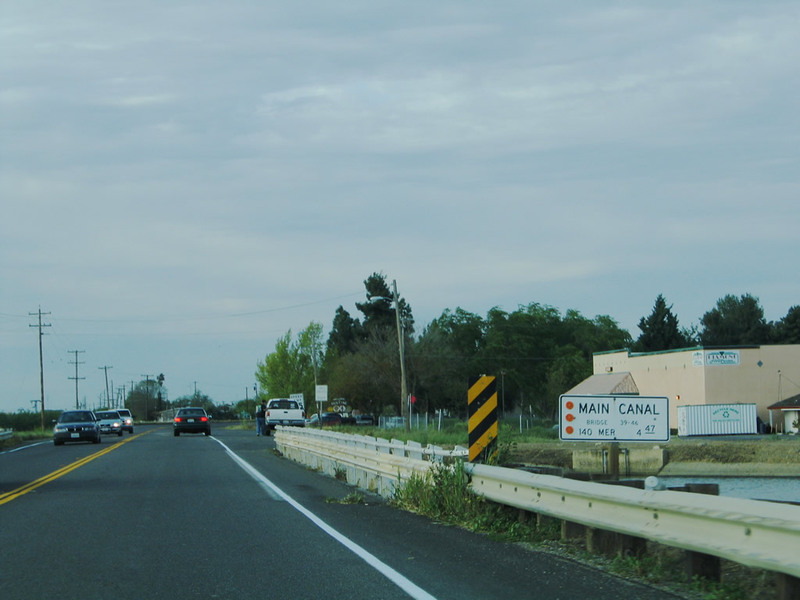 This canal interconnects with the California Aqueduct system and generally parallels it. Photo taken 04/03/05. 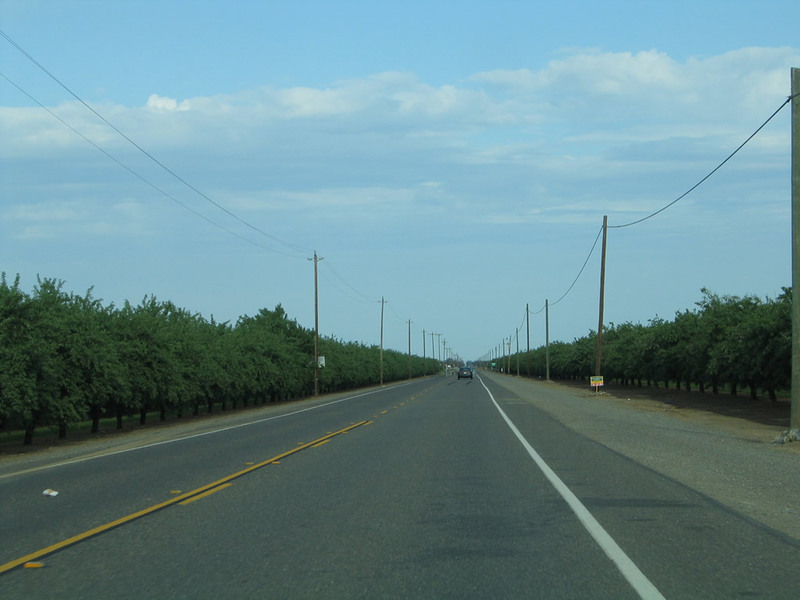 Orchards and agricultural fields line both sides of California 140 as the state highway approaches Gustine. Photo taken 04/03/05. 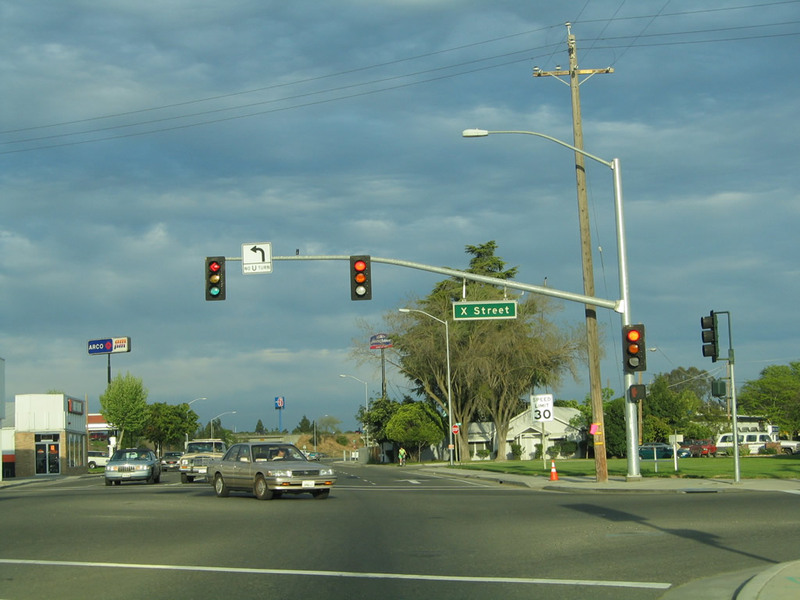 California 140 will make a left turn from Sullivan Road onto California 33/Jensen Road north. 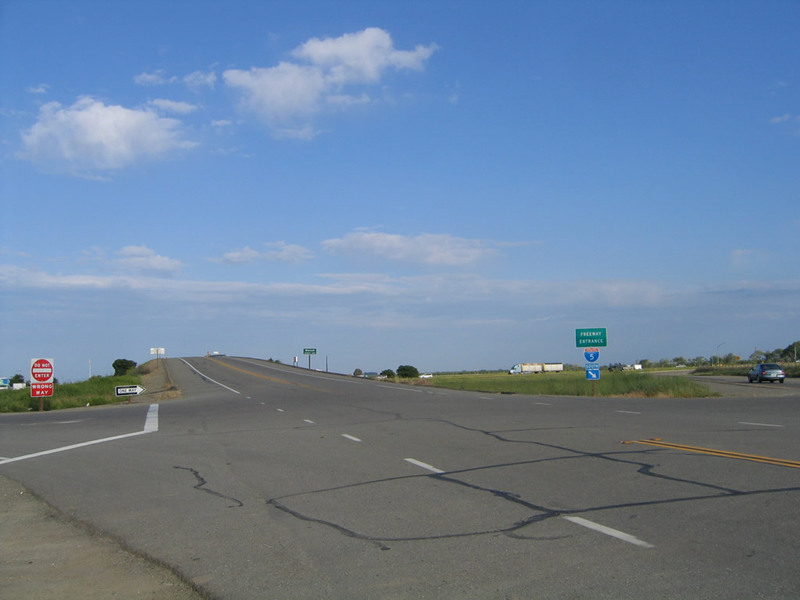 Gustine sits on California 33-140; the routes divide north of downtown Gustine. Photo taken 04/03/05. 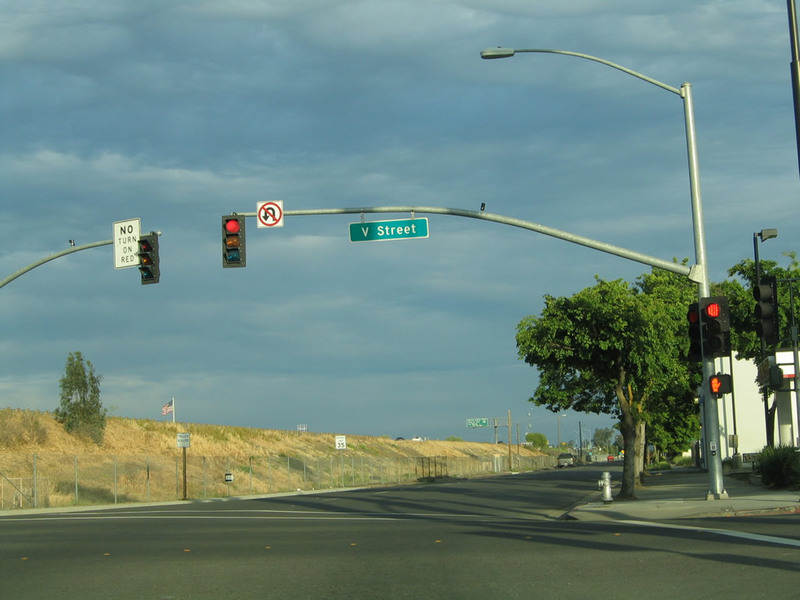 Turn left here to follow California 33 north and California 140 east to Gustine; turn right to follow California 33 south to Santa Nella and Interstate 5 near the O&apos;Neill Forebay. Photo taken 04/03/05. 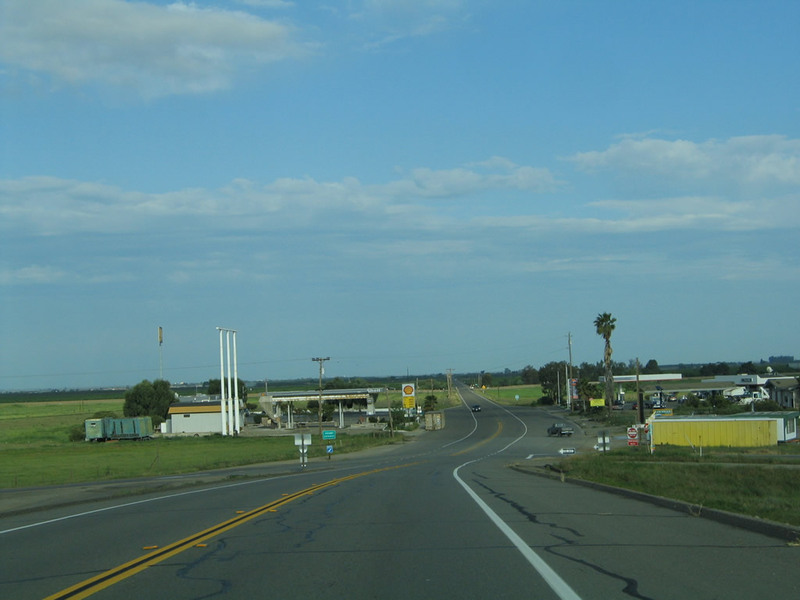 Turning north, California 33 and California 140 share Jensen Road as they enter the city of Gustine, the "Festival Hub of the Valley." 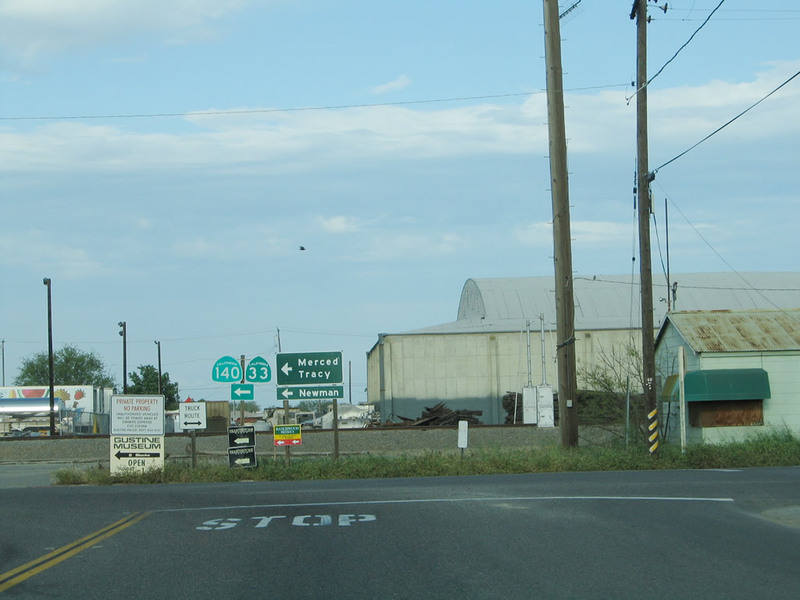 Gustine was incorporated in 1915, is home to 4,698 people as of the 2000 Census, and consists of 1.2 square miles. Agriculture and dairy farms dominate the economy, even as encroachment from suburban areas to the north continues to move toward Gustine. 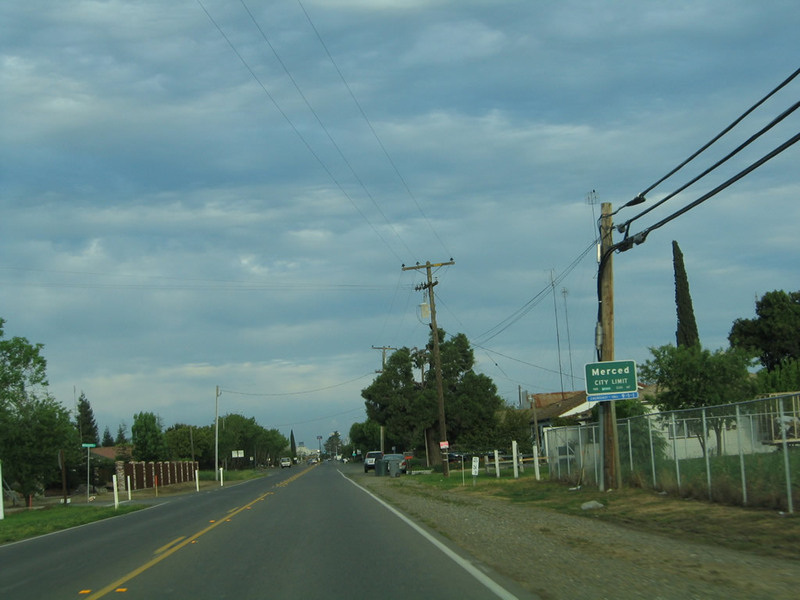 The population of Gustine includes a significant Portugese-American population. Photo taken 04/03/05. 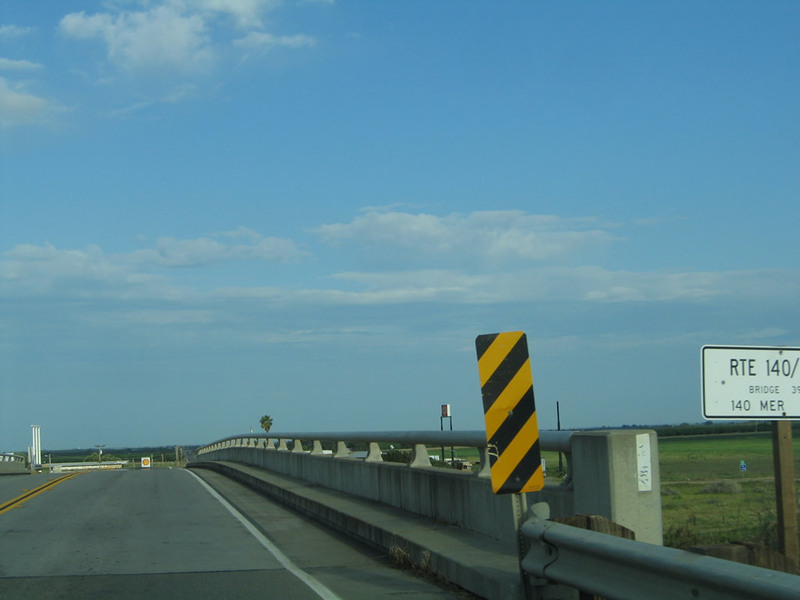 Northbound California 33 and eastbound California 140 cross over the Main Canal on this bridge. 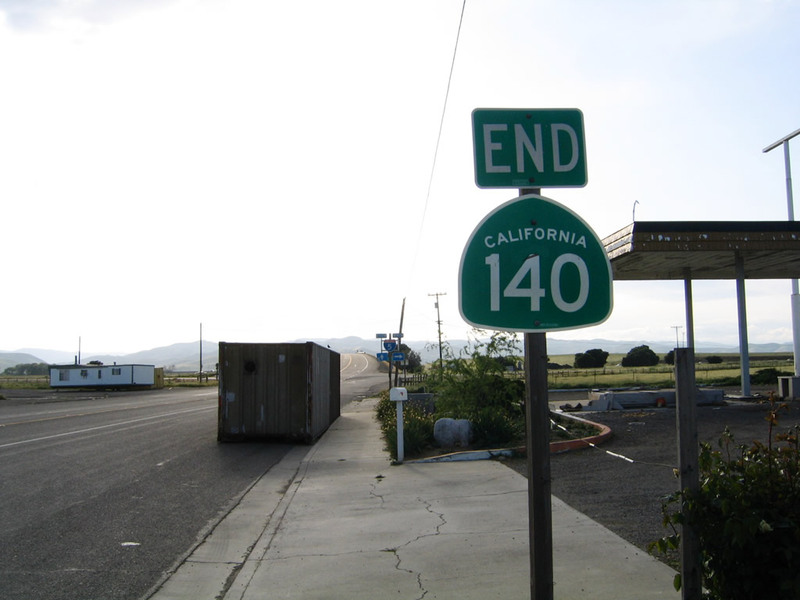 Note that California 140 is the through route, since the bridge number corresponds to State Route 140. Photo taken 04/03/05. As California 33 and California 140 turn east around Harry Schmidt Park, the road changes from Jensen Road to South Avenue. Photo taken 04/03/05. Residences and houses line both sides of California 33-140. The state route follows South Avenue, which changes into 6th Avenue after passing 6th Street. Photo taken 04/03/05. Northbound California 33 and eastbound California 140 turn from 6th Avenue east onto 4th Street north. 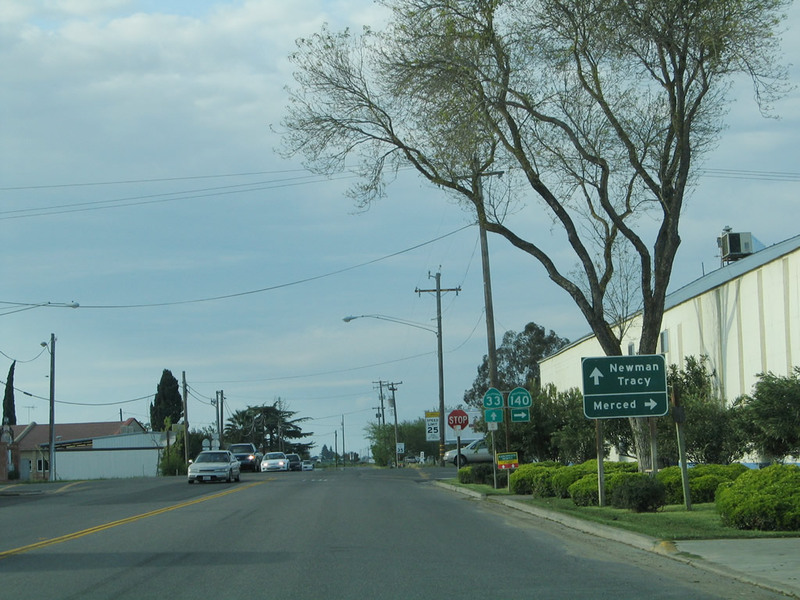 The control cities of Newman and Tracy are via California 33, while the control city of Merced is for California 140. Photo taken 04/03/05. About six blocks north of the previous spot, we approach the intersection of Fourth Street and First Avenue west/North Avenue east, which is where the routes divide. Northbound California 33 continues along Fourth Street toward Newman, while California 140 turns east onto North Avenue. Photo taken 04/03/05. After leaving California 33/Fourth Street, eastbound California 140 crosses a railroad. Photo taken 04/03/05. The next major intersection along eastbound California 140 is with Hunt Road north and East Avenue south. Photo taken 04/03/05. 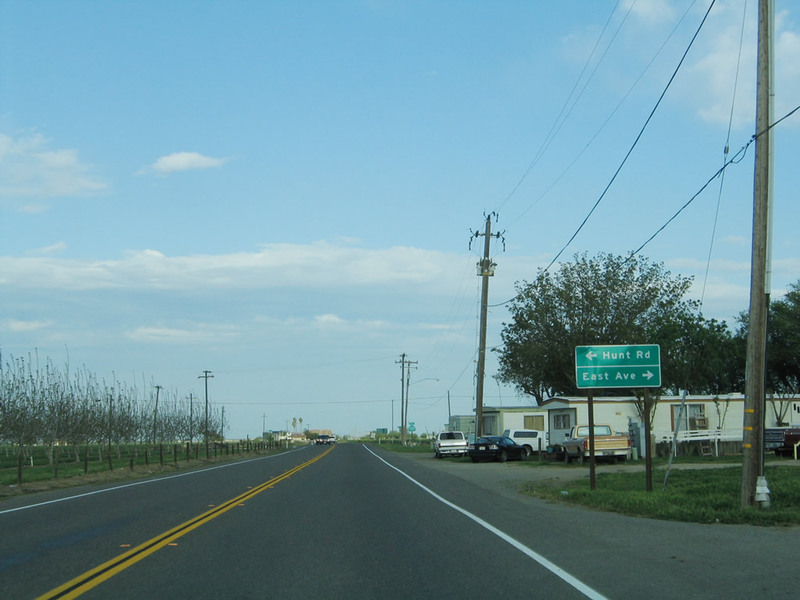 A California 140 east reassurance shield is posted shortly thereafter; the state highway starts to leave the city of Gustine. Photo taken 04/03/05. 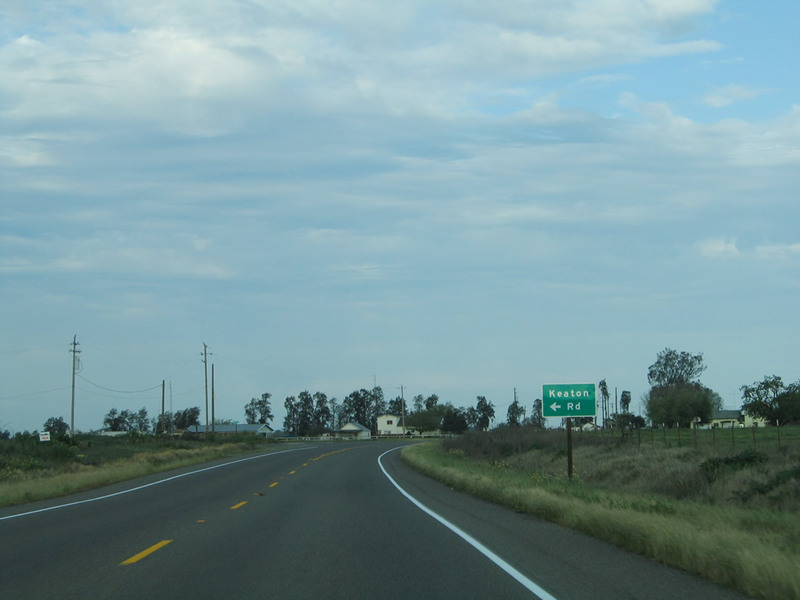 This mileage sign along California 140 east provides the distance to Merced (30 miles), Mariposa (66 miles), and Yosemite National Park (110 miles). California 140 ends at the west entrance to the national park as it follows the Merced River toward Yosemite Valley. Photo taken 04/03/05. 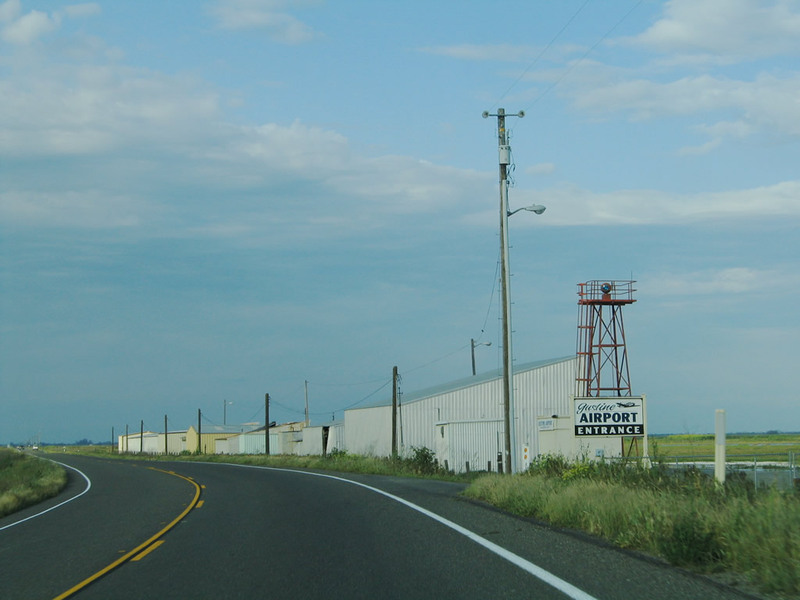 California 140 passes by the Gustine Airport as it leaves the urban area and prepares to enter the San Luis National Wildlife Refuge. Photo taken 04/03/05. The San Luis National Wildlife Refuge features wetlands and a major stop for migratory birds along the Pacific Flyway. 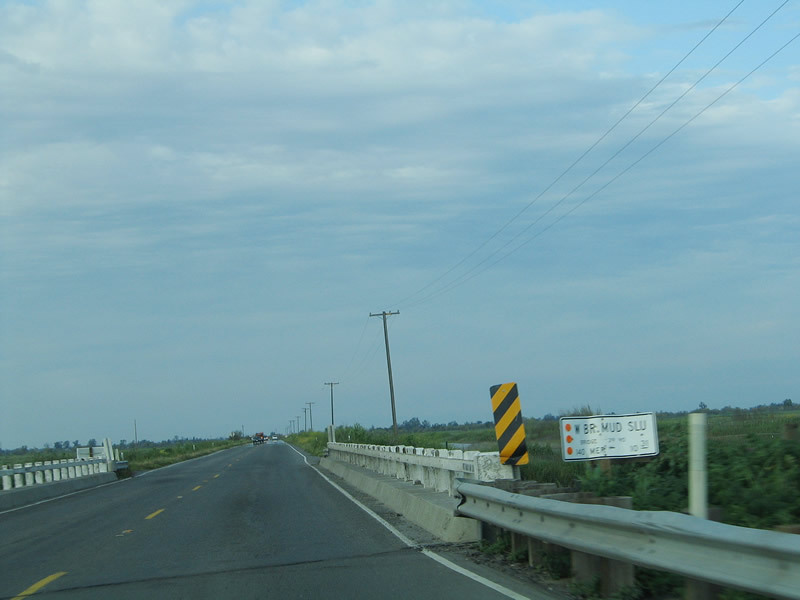 California 140 will pass through the scenic and undeveloped wetlands for the next several miles. Photo taken 04/03/05. Passing through the Kesterson Unit of the San Luis National Wildlife Refuge California 140 crosses several waterways and wetlands, using bridges such as these. Photos taken 04/03/05. 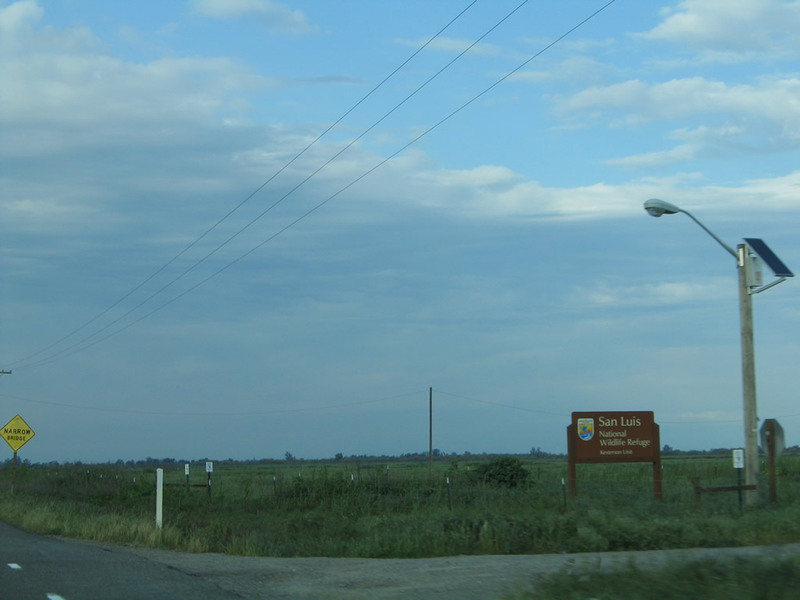 California 140 leaves the national wildlife refuge after crossing the San Joaquin River. 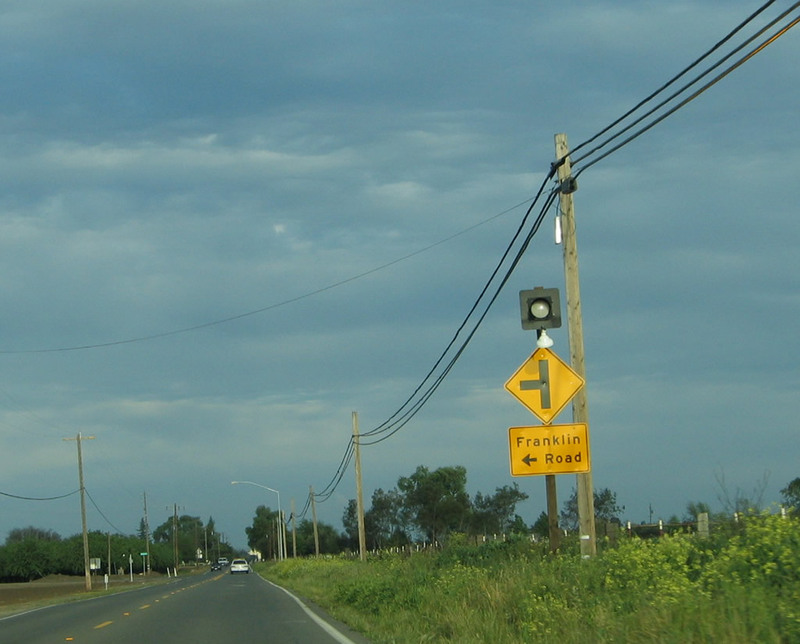 The next major intersection is with Keaton Road north to Merced County J-18 (Westside Boulevard). Photo taken 04/03/05. 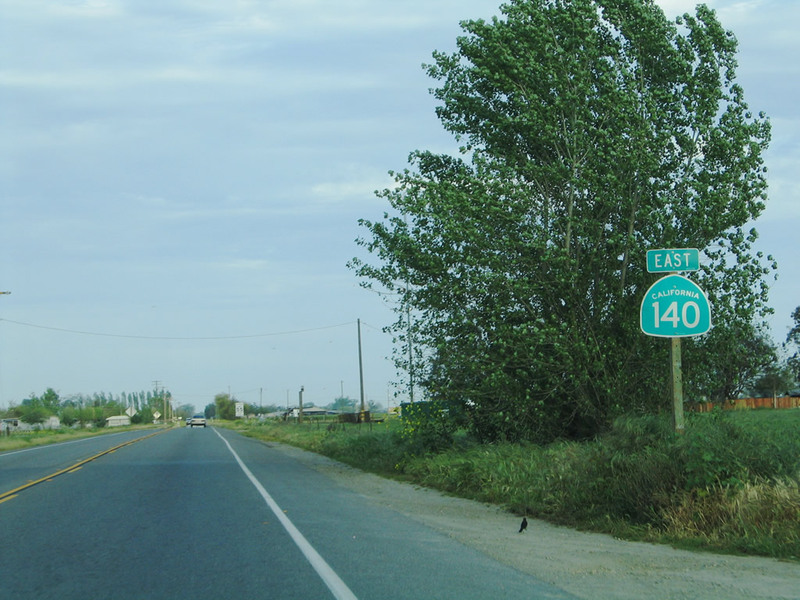 Eastbound California 140 approaches California 165 (Lander Avenue) near the town of Stevinson. 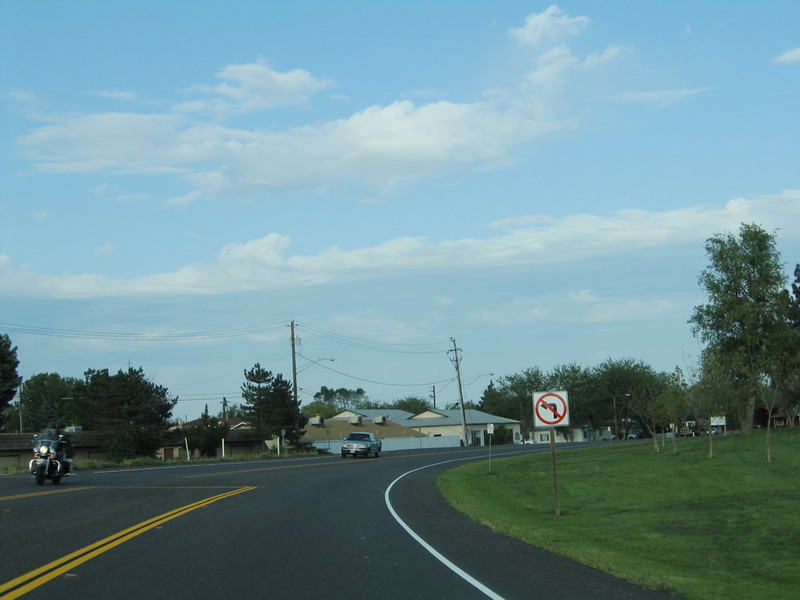 Two stop ahead signs warn of the pending intersection. Photo taken 04/03/05. 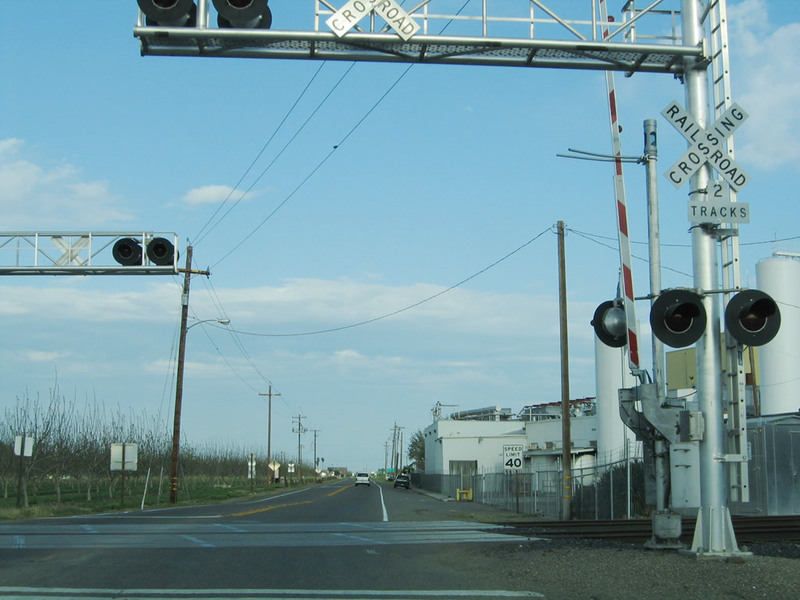 Use California 165 north to Stevinson (one mile) and Turlock (13 miles). 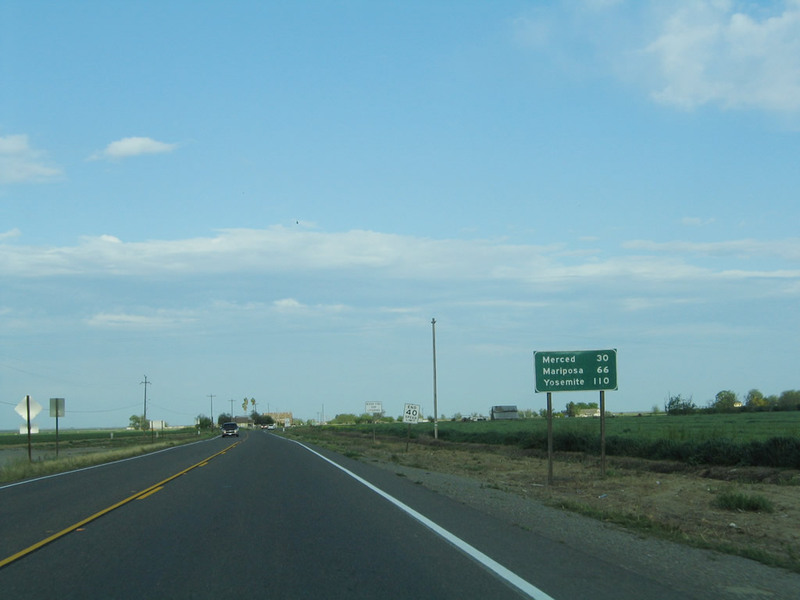 To the south, California 165 connects with California 33-152 in Los Banos (20 miles) and eventually with Interstate 5 at Exit 391 near the Dos Amigos Pumping Station and Visitors Center along the California Aqueduct. Photo taken 04/03/05. 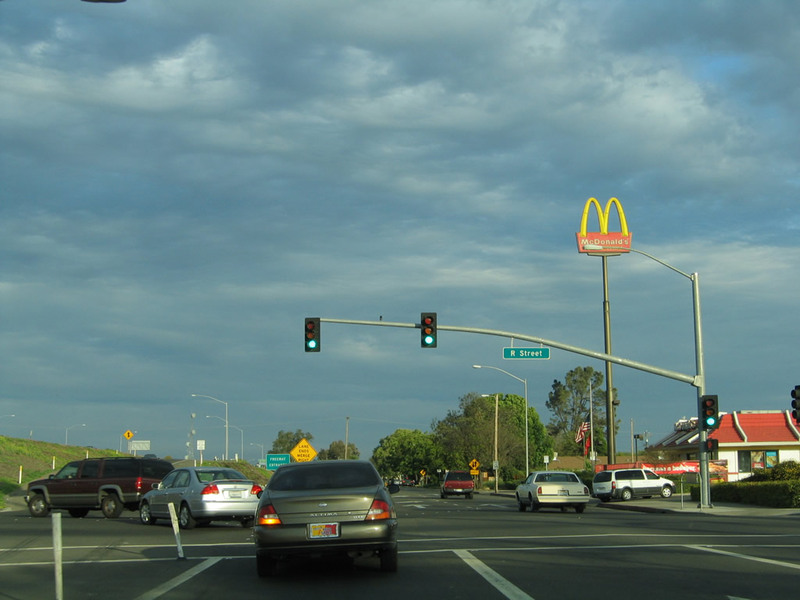 California 165 north also serves Hagaman Park (near the junction with Merced County J-18 (Westside Boulevard) near the Merced River crossing). 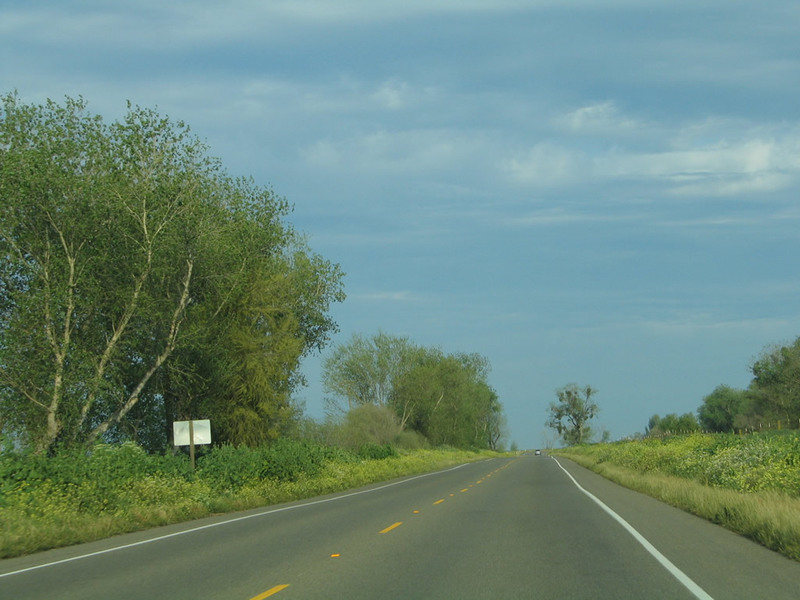 California 165 also passes through San Luis National Wildlife Refuge as it passes through the San Joaquin River wetlands. Photo taken 04/03/05. 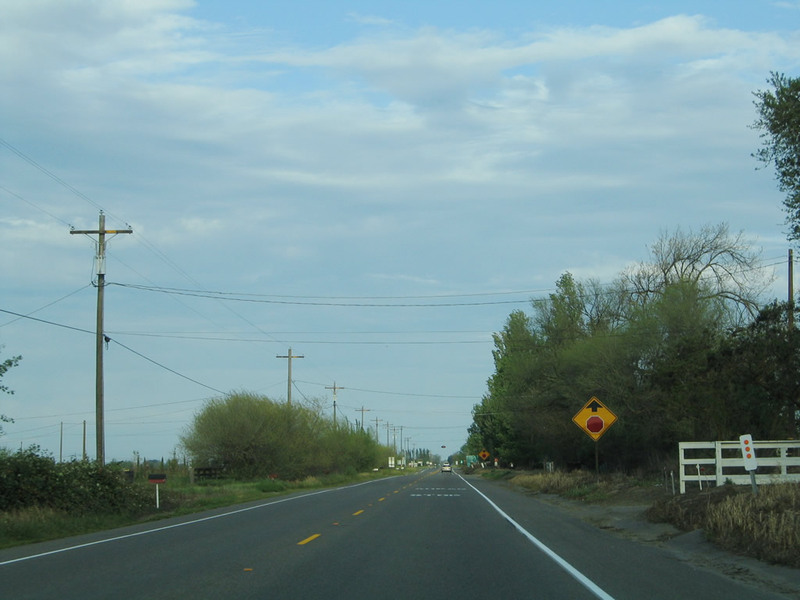 A California 140 reassurance shield is posted after the California 165 intersection. Photo taken 04/03/05. This beautiful springtime view is afforded along eastbound California 140 prior to and after the Weir Avenue intersection east of Stevinson. Photos taken 04/03/05. 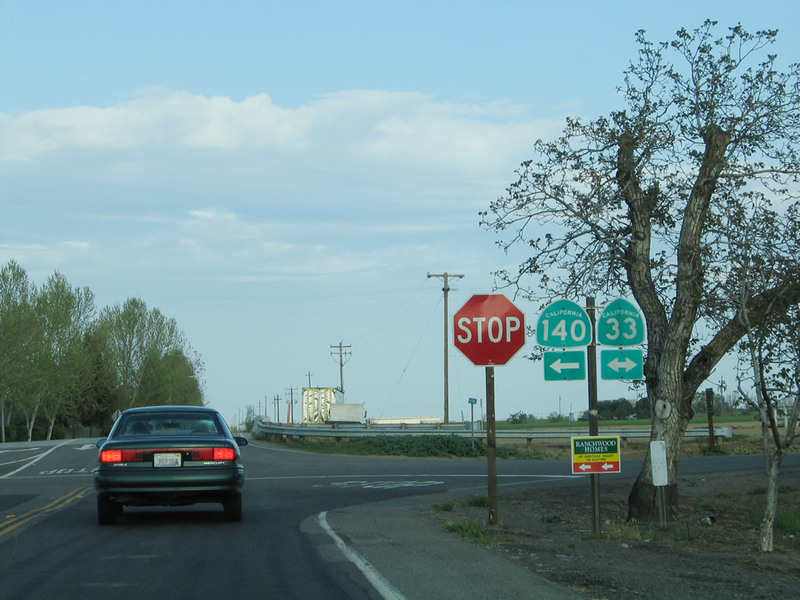 For the remaining distance east to Merced, California 140 will generally follow Bear Creek. 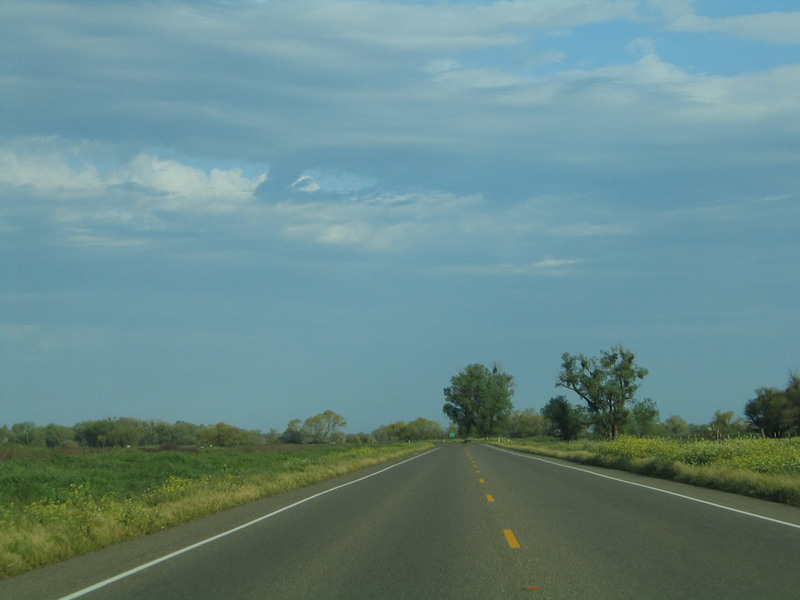 The southern side of the highway may have less developed lands (including wetlands), while the north side has more agricultural development. 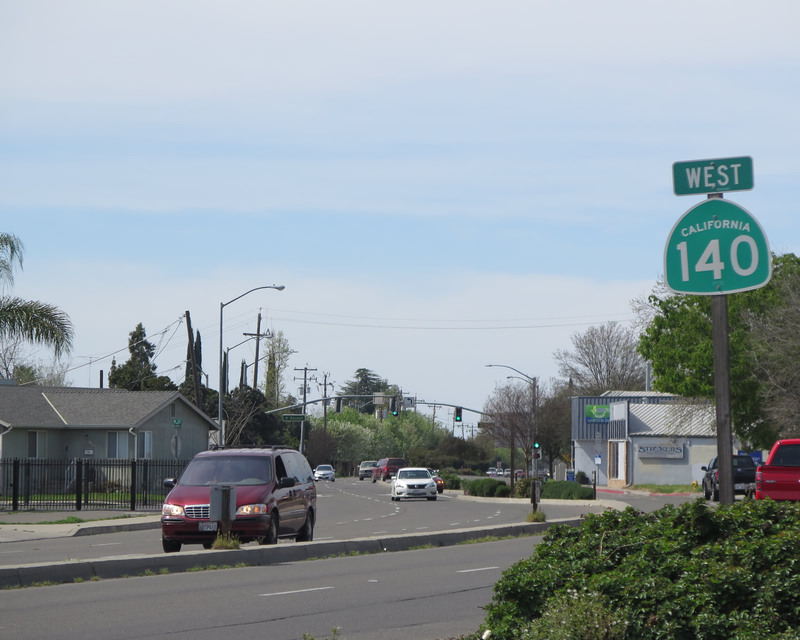 Here, California 140 approaches Washington Boulevard. Photo taken 04/03/05. 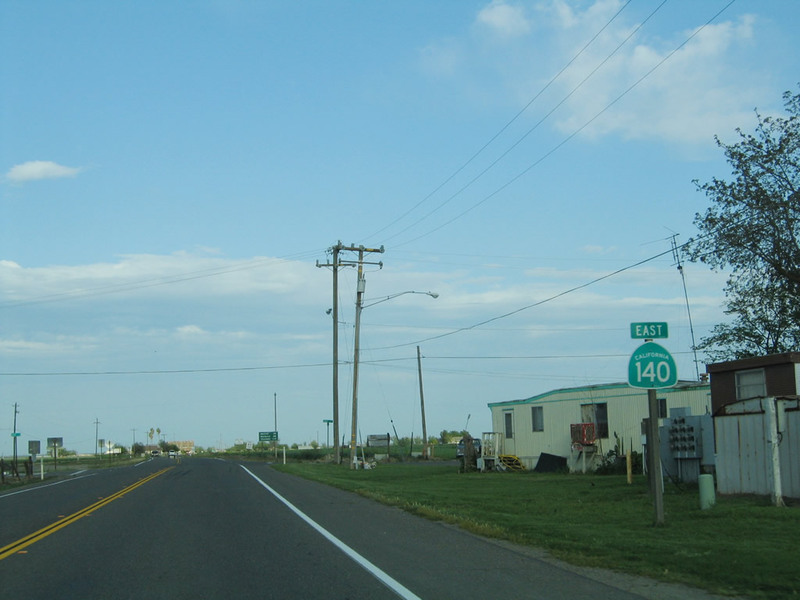 Several miles east (after passing the Joseph Gallo Dairy and Cheese Plant), California 140 approaches Bert Crane Road. Photo taken 04/03/05. 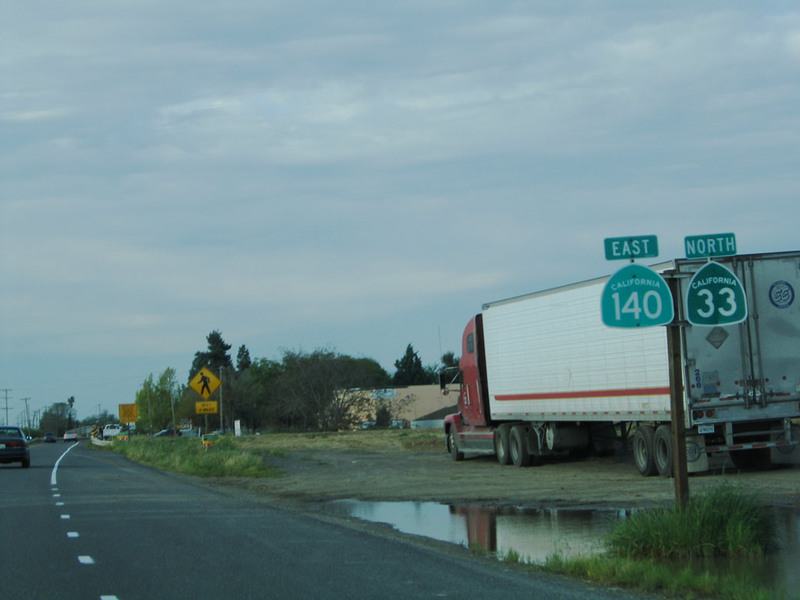 About a mile east of Bert Crane Road, eastbound California 140 approaches Applegate Road north to California 99 at Atwater. It&apos; hard to believe, but only three miles separate California 99 and California 140 at this point, even though it&apos; still about seven miles east to Merced. Photo taken 04/03/05. About a mile east of Applegate Road, eastbound California 140 (McSwain Road) approaches Buhach Road. Photo taken 04/03/05. Soon thereafter, California 140 passes over Bear Creek. Photo taken 04/03/05. 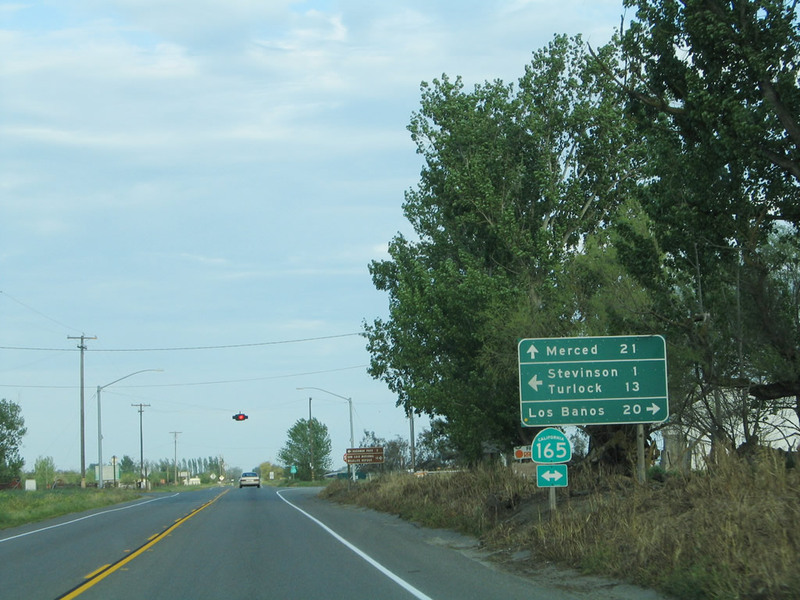 Prior to entering the city of Merced, California 140 approaches Franklin Road north to California 99 at Exit 191. Photo taken 04/03/05. 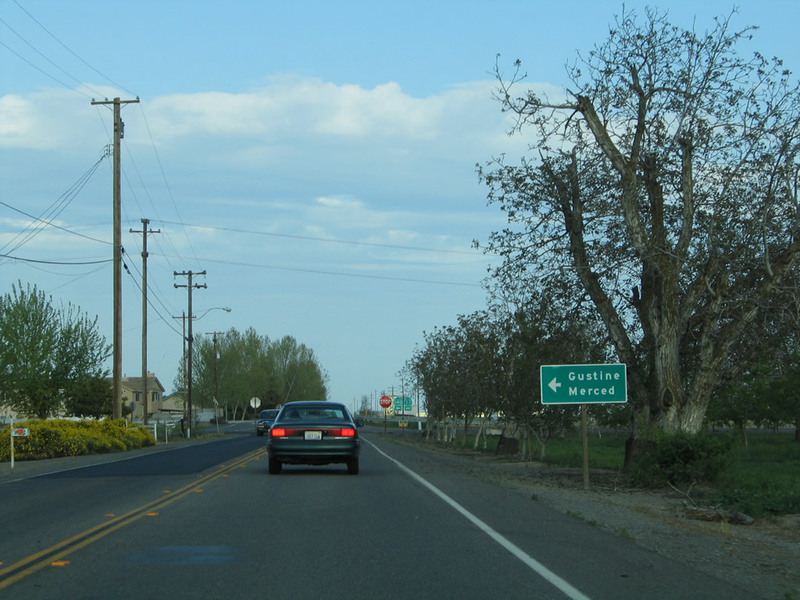 Eastbound California 140 enters the city of Merced, the seat of Merced County. Like many cities in the Central Valley, Merced has seen substantial growth through the 1990s and 2000s. The University of California Merced opened its doors in September 2005 to new students, and the town is the main "Gateway to Yosemite" from the Central Valley. 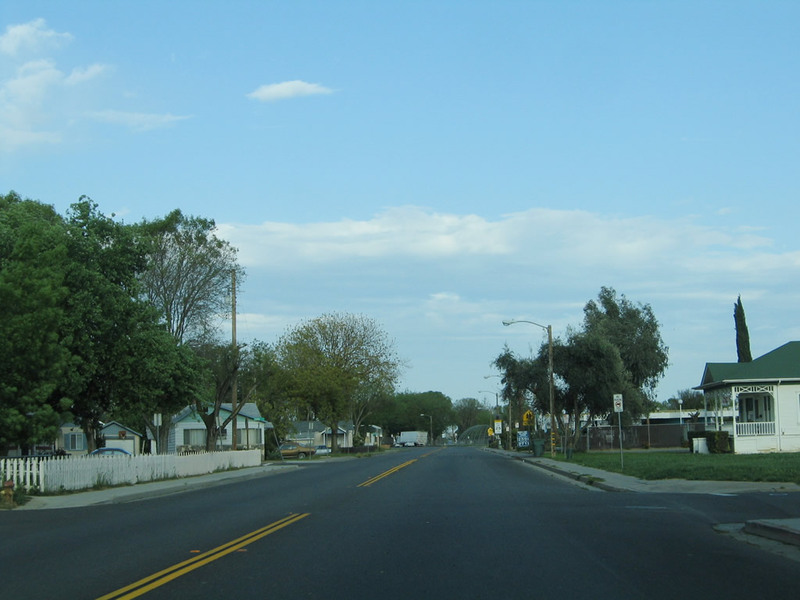 Merced was incorporated in 1889 and is home to 63,893 people as of the 2000 Census. Photo taken 04/03/05. California 140 immediately passes through residential before finding motorist services associated with the California 99 freeway. Here, California 140 east meets X Street; the California 99 freeway is visible in the distance. Photo taken 04/03/05. At California 99, eastbound California 140 turns southeast onto 13th Street, a frontage road that parallels the freeway. 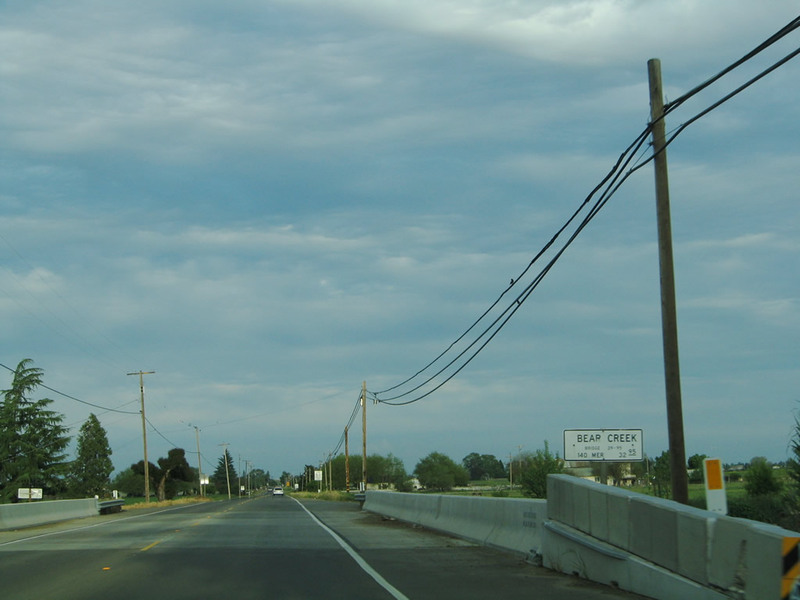 Follow this frontage road southeast until California 140 merges onto California 99 south. Photo taken 04/03/05. After passing by R Street, eastbound California 140 merges onto California 99 south. 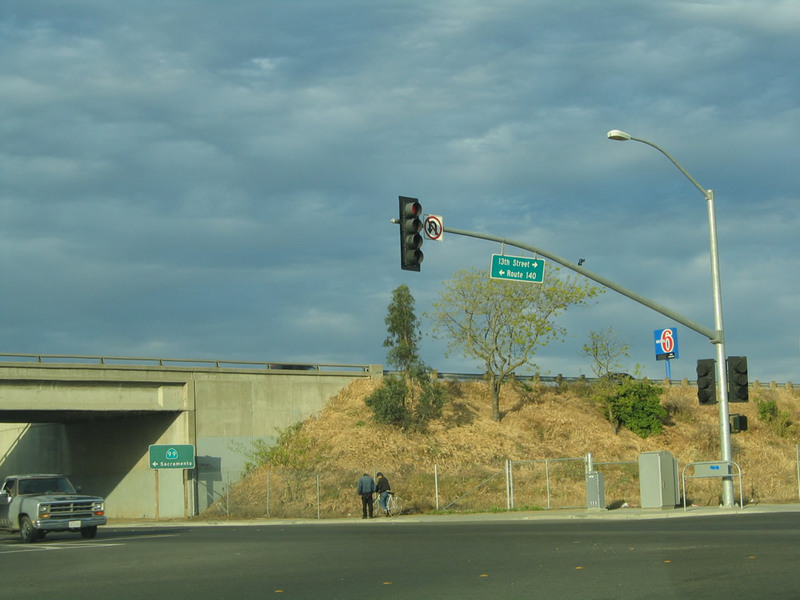 The two state routes merge only briefly; the second exit on California 99 south allows California 140 to depart the freeway. Photo taken 04/03/05. 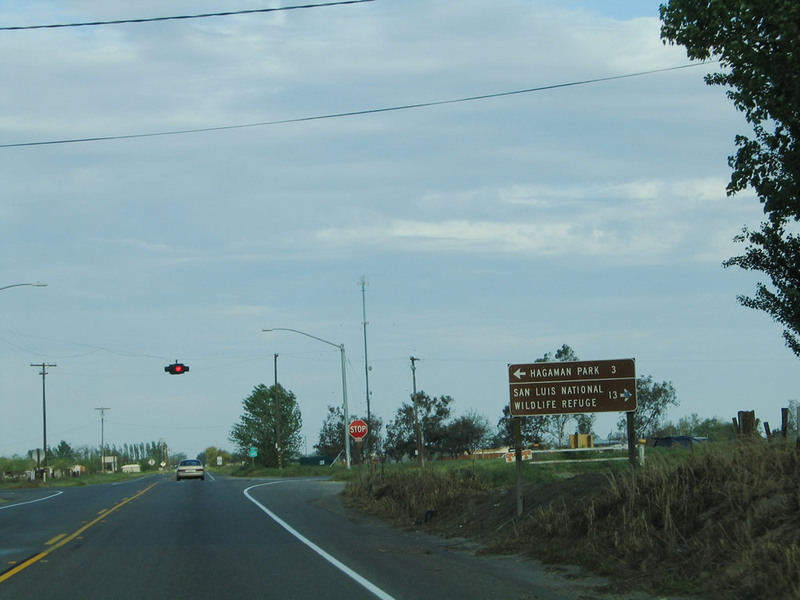 After separating from California 99 and California 59 near downtown Merced, westbound California 140 proceeds west along McSwain Road en route to Stevinson and Gustine. Photo taken 03/15/15. 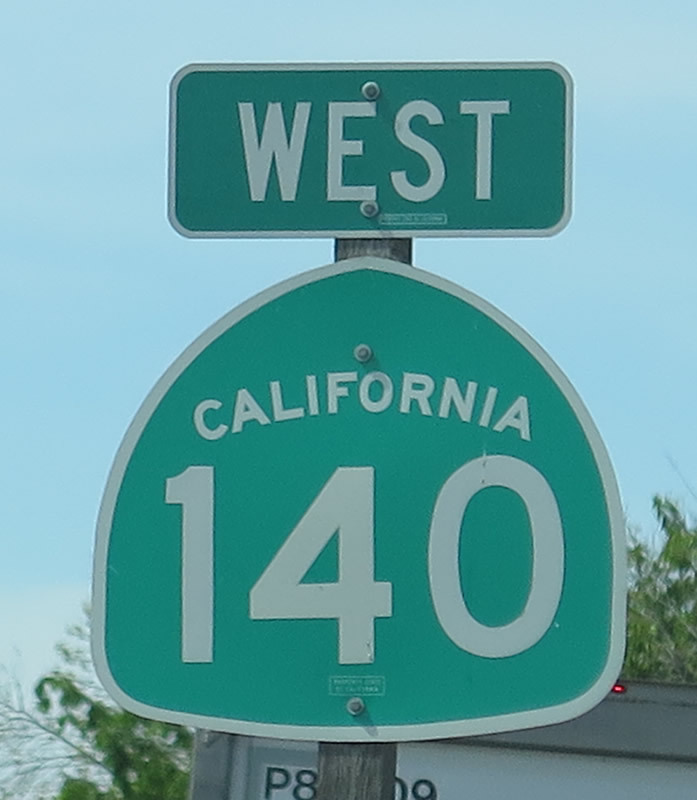 Here is a close-up of the California 140 west reassurance shield on McSwain Road in Merced. Photo taken 03/15/15. Skipping ahead, we are now approaching the Interstate 5 interchange, where an end California 140 shield assembly is posted on the two-lane highway. This is the termination point for this east-west state route. Photo taken 04/03/05. A rare neutered Interstate 5 trailblazer is posted on westbound California 140 after the end shield assembly. 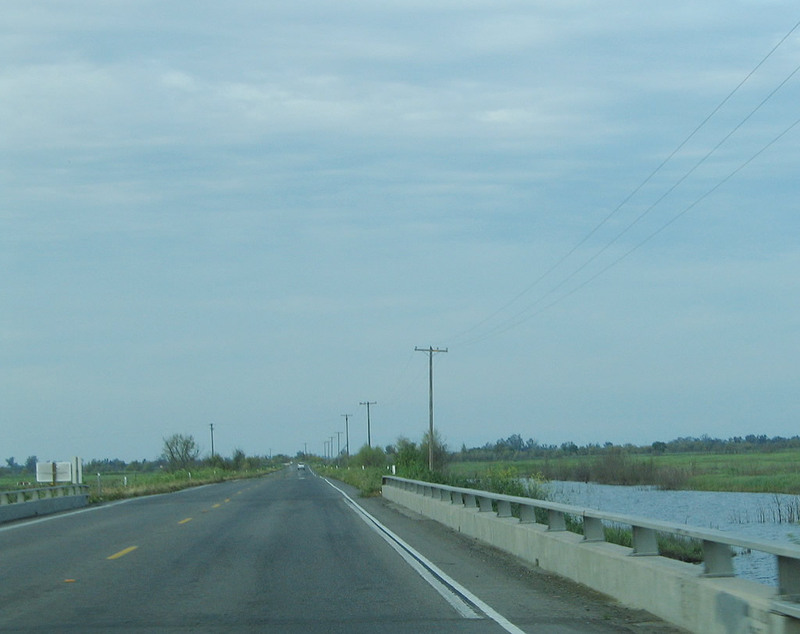 The first right connects to Interstate 5 north to San Francisco, Stockton, and Sacramento. 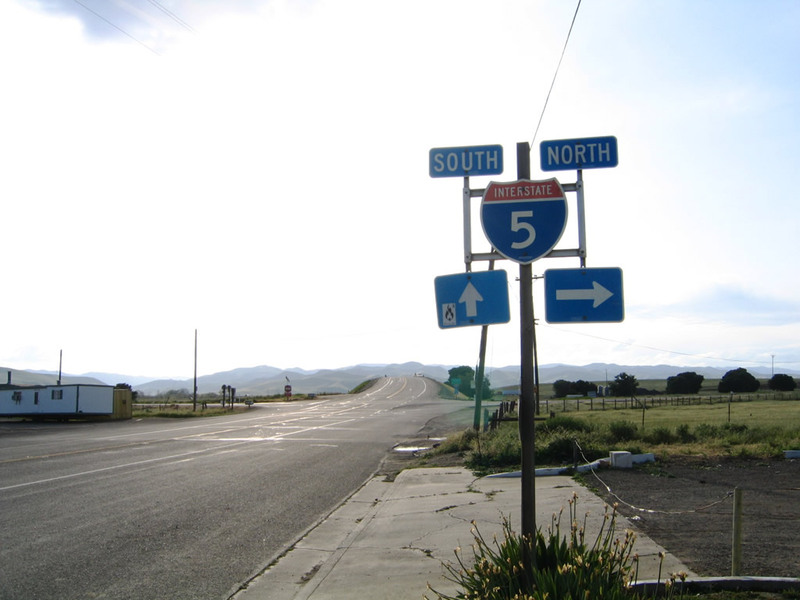 The next left connects to Interstate 5 south to Fresno, Bakersfield, and Los Angeles. Photo taken 04/03/05. Page Updated October 10, 2015.